CHICAGO (AP) — Christian Yelich and the Milwaukee Brewers were on top of the NL Central for much of the season’s first half. Then Anthony Rizzo and the Chicago Cubs moved into the lead of what just might be baseball’s best division. Then Yelich powered the Brewers to one more charge. So of course, it’s going to extra innings. Milwaukee visits Chicago on Monday for the first tiebreaker in major league history in which the loser doesn’t go home. The winner advances to the Division Series, the loser to Tuesday’s wild-card game against the loser of the NL West tiebreaker later Monday between Colorado and the Los Angeles Dodgers. 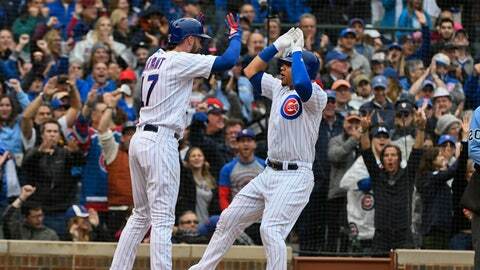 The winner at Wrigley Field gets home-field advantage throughout the NL playoffs, starting with a Division Series on Thursday against the wild-card winner. Chicago had a five-game lead on Sept. 2, but Milwaukee won seven straight and nine of 10 overall to finish with a 95-67 record. Yelich led the way, rising to the top of the NL MVP conversation and making a bid for the Triple Crown by hitting .383 with 13 homers and 42 RBIs in his last 30 games. The playoff-tested Cubs are going for their third straight NL Central title. They went 11-8 against the Brewers this season but dropped two of three in each of their two September series. Planning for a possible tiebreaker, Chicago has Jose Quintana lined up on regular rest. The left-hander is 6-2 with a 1.60 ERA in 10 starts against Milwaukee. Milwaukee did not announce a starter, but the Brewers’ deep bullpen might be the biggest concern for the Cubs.